Habitat: The plant is native to North America. Traditionally, it has been produced on wetland sites. 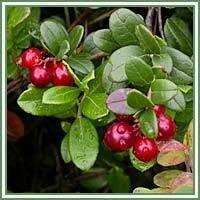 Cranberry requires poorly to moderately well drained, sandy soils. Description: Cranberries are low, evergreen shrubs of creeping habit, with slender wiry stems and small leaves arranged alternately along the stem. Flowers have reflexed petals, dark pink in color. Fruits are berries, which turn red when fully ripe. 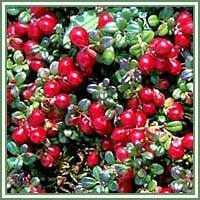 Medicinal use: Traditionally, Cranberry was used for various ailments, such as digestive problems, appetite loss, blood disorders. It is an excellent source of vitamin C. Cranberry juice has the most beneficial effects in preventive treatment of urinary tract infections caused by Escherichia coli. It can also prevent the bacteria Helicobacter pylori (usual cause of stomach ulcers) from attaching to stomach walls. Cranberry fruit is high in antioxidants, mainly from substances called proanthocyanidins. Antioxidants neutralize particles in the body known as free radicals. The antioxidants found in Cranberry are useful protection against heart disease. They can lower LDL cholesterol, relax blood vessels, and prevent plaque from building up in arteries. Recent studies even suggest the possibility that Cranberry could play an important role in inhibition of cancer cells growth.